In its seventh iteration, the Great Rivers Biennial, a collaborated effort between Contemporary Art Museum St. Louis and the Gateway Foundation, showcases the work of three talented, emerging or mid-career artists based in St. Louis. In addition to providing them with a major summer exhibition at CAM, the Biennial awards all three artists a $20,000 honorarium to help jump-start their artistic careers. Juried by Anne Ellegood, Senior Curator at the Hammer Museum; Valerie Cassel Oliver, Senior Curator at Contemporary Arts Museum Houston; and Paul Pfeiffer, sculptor, photographer and video artist, this year’s Biennial selected from over eighty applicants. Only after in-depth studio visits between all three jurors and ten semi-finalists were this year’s recipients chosen: Lyndon Barrois Jr., Tate Foley and Nanette Boileau. Bridging sculpture, installation and video, all three artists eloquently articulate the construction of identities, mythologies and systems of power through the act of their very deconstruction. In his exhibition Post No Bills, Tate Foley’s large-scale sculptural assemblages, Factions, and his twelve single-channel video work, Omni, both phonetically break down the language of protest, disarming ambiguous terminology and stripping it of often subtle, nuanced hidden meanings. Foley’s structures, wheat-pasted with risograph prints of phonetically spelled out words such as “VAH-LIH-TULL” and “SIS-TEM-MAT-ICK”, recall billboards by referencing the way language in the media, often formalized, maintains hierarchies of cultural status and privilege. Nanette Boileau’s three channel video installation, Dakota Territory, filmed over the course of several months in southeastern Wyoming and the Black Hills of South Dakota, unpacks and reconsiders national mythologies of the West and those who inhabit it. Shedding light on the realities of contemporary rural life in the face of modernization and current agricultural economics, Boileau depicts scenes from live cattle birth to annual roundups and mass shipments of livestock to be sold at auction. Idealizations of the western landscape and the "cowboy” are re-examined as viewers are offered a much more encyclopedic view of the pastoral American West. Finally, in Of Color, Lyndon Barrois Jr. deconstructs racial identities through use of life-size assemblages and the installation of an outdoor basketball court in the gallery space. The assemblages are composed of used toner boxes and freestanding cutouts taken from popular print-media imagery. His work pushes viewers to question avenues of accessibility and visibility for marginalized groups. Chief Curator Jeffrey Uslip’s decision to include the work of acclaimed artist Mark Bradford in both the front room and project wall serves as a nice compliment to Lyndon’s work in thinking about the political nature of racial identity. Bradford’s thirty-eight collaged compositions on canvas, Receive Calls on Your Cell Phone from Jail, exhibited on the project wall, touch upon issues of socioeconomic disenfranchisement, particularly towards lower-income communities of color. In one of his earlier video works, Practice, on view in the front room, Bradford desperately attempts to shoot hoops in a makeshift outfit consisting of a Los Angeles Lakers uniform and a capacious antebellum-style hoop skirt. Bradford is investigating how assumptions based on race, gender and appearance shape societal interactions and determine means of access and opportunity. Bradford’s work in particular offers a apt segue-way into Lyndon’s exhibition. I wanted to sit down and talk with Lyndon about the thinking processes behind his work and the methodology for carrying his ideas to fruition. 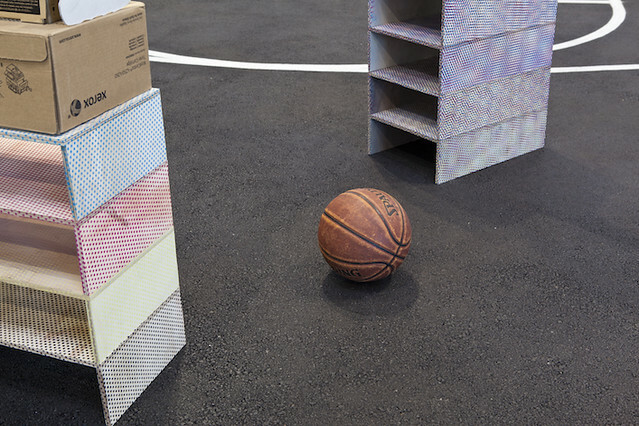 Seth Lewis: When viewers first step foot on the asphalt, they’re immediately forced to situate themselves in relation to these life-size assemblages or “players” within the context of the basketball court. There are obvious parallels here to Mark Bradford’s video piece Practice, but how do you see the “court” functioning in your own work? How does it participate within broader discourses on race, representation and popular culture? Lyndon Barrois Jr.: If I’m talking about where courts aren’t, to present one in a space where someone’s not expecting it, it could possibly draw attention to the absence of where he or she would expect it. I was also thinking about my own relationship to courts growing up playing on them, understanding how formative of a space the outdoor basketball court can be and recognizing the culture that gets built around them is quite complex. I think about the AND1 mixtapes from the late 90’s, when the athletic apparel brand AND1 sponsored the wide release of these video mixtapes, a compilation of street ball tournaments in New York City set to music. It set the culture of street basketball ablaze. It was a move from the league, and a more formal relationship to basketball and made it this whole other thing. Rules were being broken and gameplay was stylized. Suddenly people weren’t emulating NBA players, they were emulating these guys who they can go to the park and see. And then even that became formalized and corporate as well. Still, that shift from the exclusive to the accessible became important in thinking about the overall culture of basketball. The fact that anyone could play the game became a lot more real for people. SL: In relation to the topic of accessibility, how do you think the kind of imagery you are using reflects that? LBJ: Accessibility as a concept is the main point of access in talking about the work. Involved is a series of parallels that I’m thinking about linguistically. We talk about art and museums as being public institutions that are accessible even though we know it doesn’t always function that way. I’m drawing a similar relationship to this court and outdoor courts in general. That in relation to these images in that they’re all found. They don’t necessarily require not only using photography but also an education or training in photography. All it requires of me is an attraction, or recognition of my own taste, desire and selectivity. In that sense, anyone could participate. SL: Some of the imagery appears to be in grayscale, and some in color. LBJ: Initially I had a hard time deciding how I was going to select the images and what the nature of the images were going to be. Also, how I was going to make the distinction between whose playing whom. We have concepts of uniforms. We have concepts of shirt versus skins. A way of organizing teams didn’t occur to me until I came across this writing by Michael Taussig, an Australian cultural anthropologist. He has a book called What Color is the Sacred? where he discusses color in the context of colonial history. He talks about the Western European aversion to color in these colonies. He recognizes that the indigenous communities that they are occupying have this embracing relationship to color, and it’s distasteful to the Europeans. He draws a relationship between that aversion to just color being worn or being surrounded by color in one’s life and this distaste towards people of color, even up to present times. He talks about color as a license transgression. You can use it, but not too ostentatiously. We still have this concept of gray/black, like neutral things as being more refined or more professional or elegant. When anything is too garish or too colorful it’s inappropriate. I think it’s an argument that’s hard to quantify, but I do find it a compelling proposition. I also see a parallel to black and white versus color photography and that these are decisions; we decide how much color we allow into our lives. I was attracted to both kinds of photography for whatever reason, but that was a way of sifting through and making sure the imagery wasn’t random. I know I needed a team of desaturated imagery. I needed a team that was more chromatic. Basketball is also about positions. It allowed for a kind of organizing system to position this versus that, but I don’t know if there is a protagonist or antagonist necessarily. SL: In these very specific decisions you’re making in regards to chromatics, you very evidently reference CMYK print production. Both with the toner boxes, and the colorfully patterned pedestals that support them, you’re also talking about the broader implications of mass reproduction and visual culture. You’re culling your imagery from popular magazines and newspapers. How do these sources in particular comment on race and visibility? LBJ: The film industry in particular reminds me of some of these issues. So often there is a lack of nuance in representation. There is a lack of nuanced attributes or characterizations associated with people of color. My background is in figurative drawing and painting. My early figurative work was trying to add a multiplicity to that narrative. I think that extends into this in that simply having certain things associated with me as an artist of color would sort of expand ones association of certain things to people of color. The sources I’m pulling from would offer a more nuanced view into what one could be interested in. I’m pulling from GQ magazine, which although has some diverse representation, isn’t necessarily a black magazine by any means. Also Martha Stewart Living, which is also not usually a source that would be expected. This work is different in form but still reflects a similar interest in what’s taken place in my past work. In terms of CMYK, I’m still baffled by the fact that these images could be made visible just through these specific dot patterns of just four different colors. I also think about a cultural parallel of four disparate things coming together towards a kind of resolution. That parallel to culture and society is so interesting to me. SL: It’s also worth pointing out that even the supposedly grayscale images are made up entirely of these four colors. LBJ: Exactly. I’m trying to reference that in those pedestals, sometimes those colors collaborate to make gray, for the most part they’re purple. I guess in the wake of Prince’s death it’s a welcome side effect. In emphasizing the dot pattern I was also thinking about distance, and the fact that they’re not completely resolute. There is a lack of clarity the closer you get to it. I’m thinking about the artificiality of images and the power they hold, even though we know they’re constructed, carefully lit and styled. That seduction still remains. I’ve talked before about my attraction to the objects in the images, but eventually my attraction to the image takes over to the point where I don’t even need the object anymore. The image is enough. SL: So I have to ask, as cliché as it may be. . .but are there any specific artistic influences you’re using as a reference? LBJ: The most obvious being Constantine Brancusi, in thinking about the modular quality his work had. It was about these figurative representations but also his interest in the pedestal, the supporting systems for the object and how they also could be part of the aesthetic experience, and that they could shift. I responded to that starting a few years ago. The beginnings of that inspiration were just sort of these cutouts placed on found furniture. I could absorb regular things that exist as they are into the artwork. The inclusion of the toner boxes was completely random but also made sense. Even using the boxes came out of necessity because I was re-showing some of those earlier works but didn’t have the furniture anymore so I started using these oblong cardboard boxes as pedestals. It was probably a year between doing that and then actually using a toner box. Even then I was hesitant to use the information on the toner box. I was just kind of interested in the shape, and later decided to expose the information on the box as well. SL: How do you see your work functioning in the context of the other two GRB artists? LBJ: That was actually one of the biggest and most pleasant surprises. I think all the work is asking particular questions as to the construction of things. Tate is thinking about language, I am in regards to racial identity and Nanette does in regards to a geographical and national identity that’s very much attached to the land. I’ve also thought about it as access to different types of economies as well. I believe Tate is thinking about language as a kind of currency -- how it gets transferred, used, abused even, who has access to it based on their understanding of it, and the power of one’s voice. I’m thinking about not only objects dressed up with purposed of being sold to people, but also the manipulation of beautiful imagery and the objectification of bodies and performance. These are identities that are able to provide a kind of service through their ability to entertain. Nanette is thinking about the industry and the economy of livestock, and how these systems have been put in place to keep that machine going. If we think about all of these different economies that are being accessed or discussed, that’s a very interesting thread that runs through everything, which wasn’t even discussed prior. There wasn’t much prior conversation between the three of us and there wasn’t much pressure from Jeffrey – we were all kind of just doing our own thing. Including Mark Bradford also, there was always an intention to include the cell phone series and Mark using the term “merchant economy” as it relates to these posters. For me it was a nice way of closing the loop. It’s another example of a local economic system that’s being identified in a body of work. SL: Where do you see yourself moving forward? Any specific projects you’re working on? LBJ: I think just as the two-dimensional work I was doing prior led to the sculptural work, I think the sculptural work is leading back towards the two-dimensional. I’ve started to explore image making again, initially using the toner pigment that I have from these spent cartridges to make drawings and paintings, some of which directly related to the boxes I’m pulling from, but then also trying to find a way back to figuration as well. I’m aligning material associated with one process of image making to another. It’s interesting; if you’re making art works to be seen as artworks, its relation to other artworks is obvious, whether intentional or not. There are times when I’m thinking about art history specifically and other times not really caring as much. But with the paintings, I’m thinking about what could be added to the discourse of painting in particular, how one can purposefully and constructively add to the narratives of representation in painting and drawing. To read Lyndon's article "Ask 4 the Moon: Prince, freedom and fiction," click here. Click image below to see more from 'Of Color,' on exhibit as part of the Great Rivers Biennial at CAM through August 21. Viewing hours Wednesday through Sunday 10:00 A.M to 5:00 P.M. and until until 8:00 P.M. on Thursdays and Fridays. Admission is free.